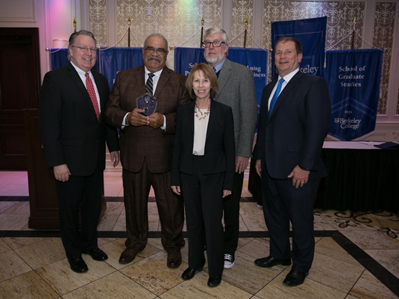 Photo Caption: Professor Clark Hill, Justice Studies, Criminal Justice, Berkeley College School of Professional Studies (second from left), receives the Commitment to Students Award during the 2018 Berkeley College Faculty Recognition Awards dinner, held on November 14, 2018, at The Terrace in Paramus, NJ. “Clark is truly dedicated to his students,” said Michael McAteer, PhD, Dean, Berkeley College School of Professional Studies. “He is always prepared to go above and beyond for his students. A dedicated professional.” Mr. Hill is a resident of Stony Point, NY. He is pictured with (L to R) Michael J. Smith, President, Berkeley College; Beth Castiglia, PhD, Provost, Berkeley College; Michael McAteer; and Kevin Luing, Berkeley College Board Chairman.